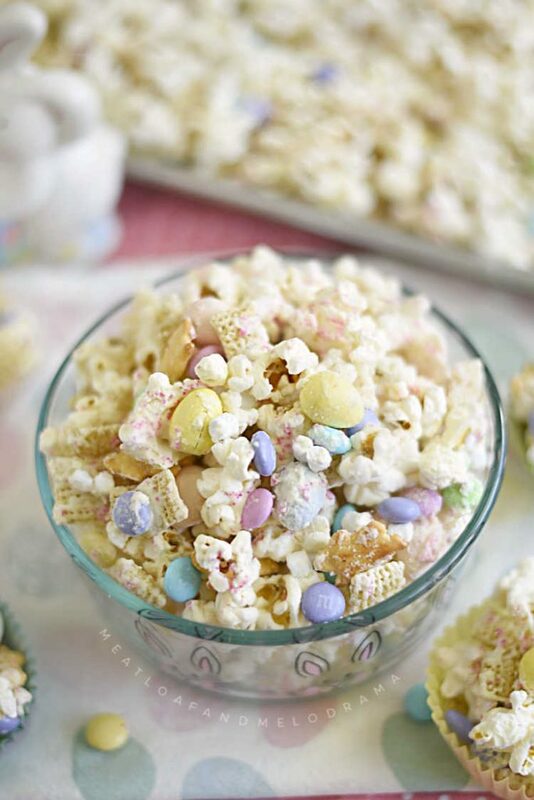 Bunny Bait Snack Mix is an easy Easter treat made with popcorn, Chex, marshmallows and candy in a white chocolate drizzle. Salty and sweet! 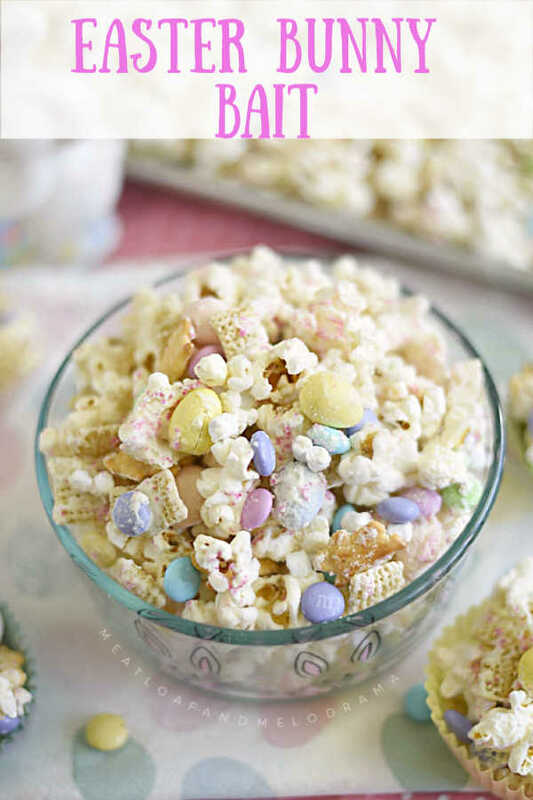 If you’re looking for easy Easter snacks, you’re going to love this bunny bait snack mix! It’s super easy to make, and it’s definitely kid friendly. But hey, bunny bait isn’t just for kids — I can vouch for that! It’s never too early to be thinking about Easter ideas, especially Easter recipes. Whether you’re serving Easter brunch or dinner, you need something to munch on while you’re waiting for the food to be served. Nothing against veggie trays and dips, but it’s a holiday, and you want fun food, too! 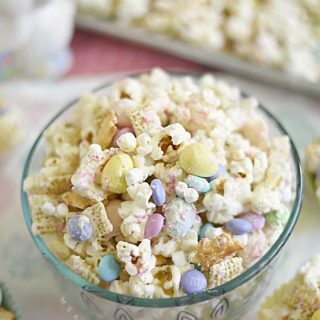 Bunny bait is a salty and sweet snack mix made with popcorn, Rice Chex cereal, chocolate candies and mini marshmallows with a drizzle of white chocolate to hold it all together. 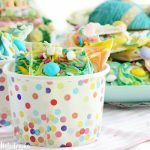 Some people call it Bunny Chow or Easter Bunny Crack, but these are all pretty much the same. To make this snack mix super easy, I started out with a bag of plain popcorn — Boom Chicka Pop. You can pop your own or use any brand. 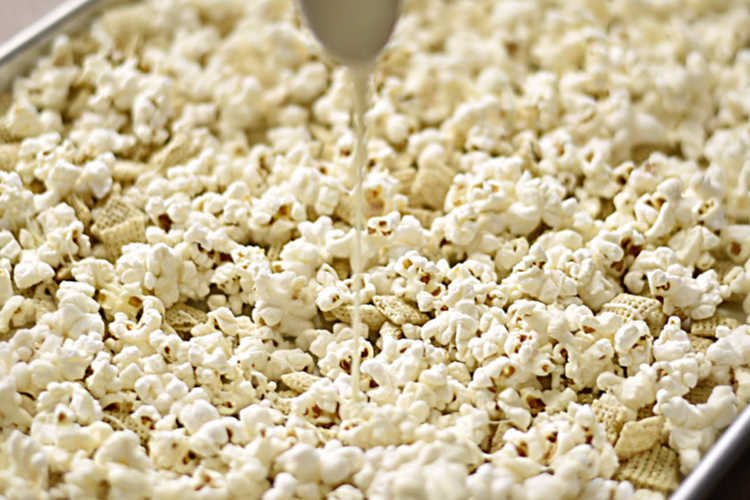 Just layer some Chex cereal and popcorn on a baking sheet, and drizzle melted white chocolate all over it. 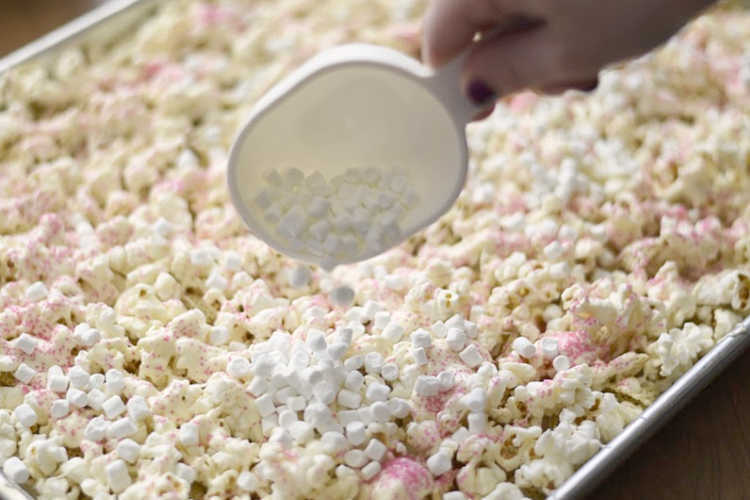 Next, toss in some mini marshmallow bits. You can find these with regular marshmallows, or you can use mini marshmallows. For an extra pop of color, I added some pink sugar sprinkles. Then, add pastel Easter eggs and M & M candies. Toss it all together, and let it hang out and dry for about 30 minutes. Of course, you have to taste it! We happened to have some Annie’s White Cheddar Bunnies, so I also tossed in a few of those. No rules here! Stir, and allow to chocolate to set and mixture to firm up -- about 30 minutes -- before serving. Store covered in cool place. 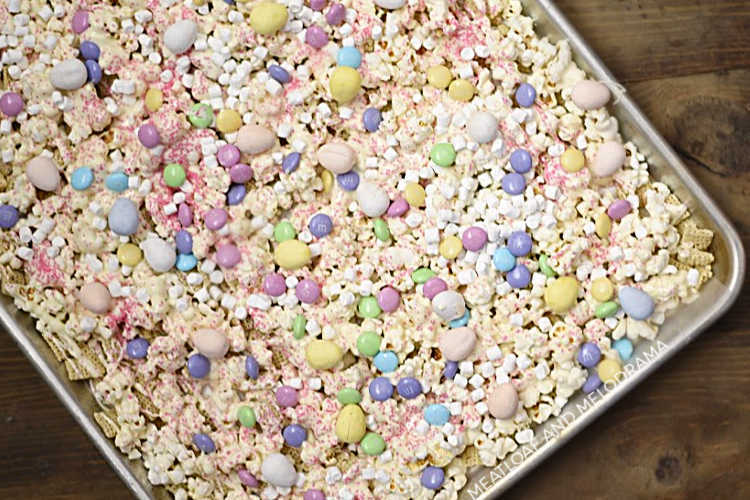 I hope you enjoy this easy Easter Bunny Bait recipe as much as we do! This is adorable for an Easter basket! Thanks, Alyssa! My kids loved it! What a fun Easter treat! So easy to make! Thanks! It’s super easy to make! Thanks, Erin. It’s a super easy treat! My kids dream right there! The perfect Easter treat! What a perfect kid (and adult) snack! I bet my nieces and nephews would go crazy over this! 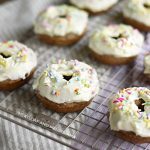 I love snacks like these that allow me to get the kiddos in the kitchen with me. I will definitely make this for Easter! My kid will love it! The kids saw this and we had to go shopping. 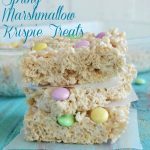 Made this great treat and then it was gone! Making it again this weekend! So happy your kids liked it, James! This is so fun!! 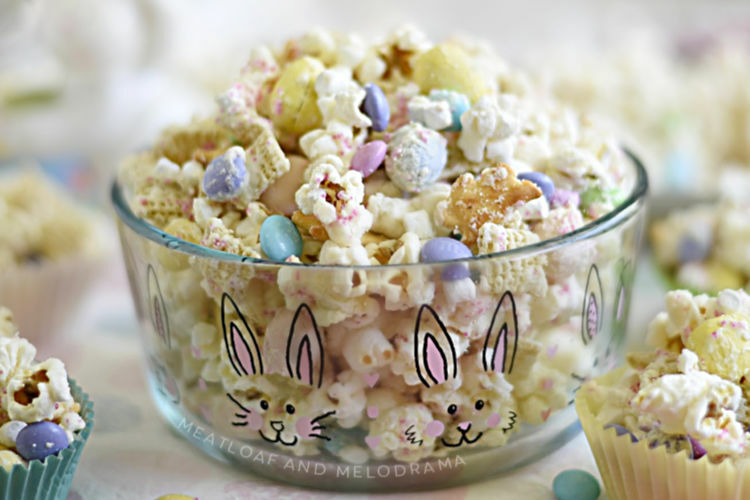 Would love to make if for Easter!